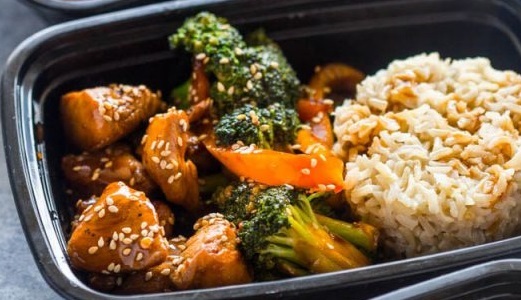 Quick teriyaki chicken and broccoli meal prep bowls make a tasty healthy lunch for the entire work week in under 20 minutes. This meal-prep version of teriyaki chicken is perfect for lunch time. It will satisfy the need for take-out without the extra calories. The chicken is not too sweet or to salt and covered in a sticky teriyaki glaze. We like to add broccoli for extra crunch and fiber but the chicken is also great alone! The dish comes together in under 20 minutes and makes 4-5 days of lunch. Prepare these meal prep dishes on Sunday or after work, and enjoy an entire weeks worth of delicious lunch. To begin, simply chop chicken breasts into small cubes and saute in a pan. Next, add my simple teriyaki sauce to the chicken and stir until the sauce is thick and glossy. At this point, feel free to add broccoli, bell pepper, onion, or any of your favorite veggies to the pan. Saute until the veggies are soft and your pretty much done! Takes 17 min , serves 4.